Dear Moon Muser, i don't know about you, but things are finally moving forward again after the last Mercury Retrograde that just ended although Mars is still retrograde until August 27th. For me this Moon feels a bit spacey (so Piscean!) and ME-focused. It's also helped me more clearly see a vision I've been feeling for some time now and to write, write, write. How is this Full Moon energy effecting you? Feel free to share your thoughts and feelings below. Affirmation: I can handle anything. When this card appears in a reading it’s time to get serious, take charge and get ‘er done! Put on your action cap or your thinking cap or whatever cap you need to help you focus on what’s important. If you’re a woman this may mean accessing your animus or your inner male – the part of you that thinks in a linear, goal focused way. Whether male or female take a moment to honour yourself and recognize all you’ve achieved so far in your life. In my own personal life I gain daily focus by writing a to-do list every morning after breakfast; a list that actually is do-able so that I can gain much needed satisfaction from checking things off my list. *Excerpted from the Lefty Oracle Deck. Soul reader, professional artist since 1992, creator of the Lefty Oracle deck, teacher of the eClass, Awaken Your Divine Feminine Soul at the Wise Woman University and author of several books including the Goddess Zodiac Playbook and Moon Musings, Kathy lives with her two dogs, Abby and Djinn Djinn and her architect husband in homes they've built themselves surrounded by the desert and forest wilderness of Temecula, California and the 1000 Islands of Ontario, Canada. Read more here. Around age forty I became a professional Soul Reader because fate basically forced me to share all my mystical know-how with others rather than keep it to myself. 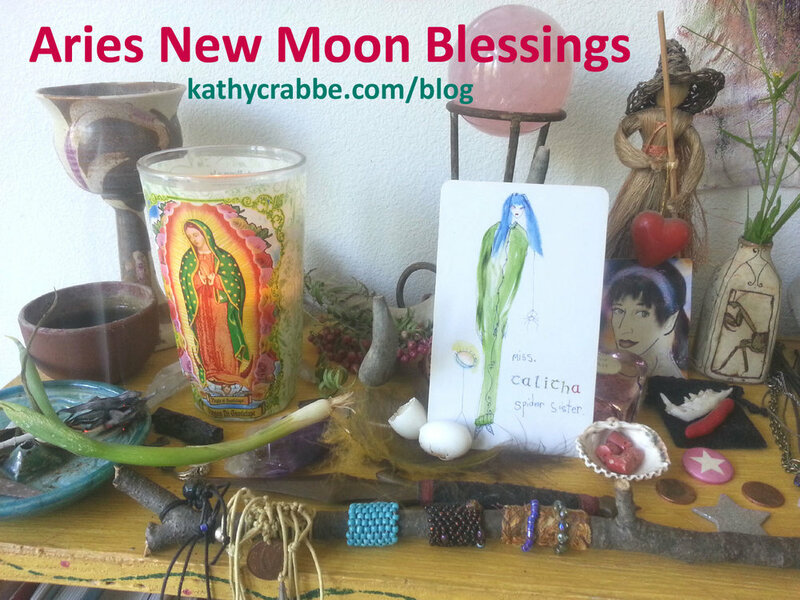 I facilitated Moon Circles in California and Canada and turned much of my work into oracle decks which I use in my soul readings, both online and in person. I continue to paint series inspired by my shamanic practice, nature, Goddess and my love of animals; both domestic and wild. Click here for Kathy's Soul Readings.